Today's card was fun to make because I used a die that had long sat in the drawer neglected. It is Spellbinders Fleur de Lis. The sentiment was a beautiful freebee from Word Art Wednesday, which was featured a few weeks back. The flower is also from Spellbinders, Die D Lites Bloom One; foliage is Mini Fanciful Flourish by Cheery Lynn. Also used were a half pearl and a hand tied double-looped yellow bow. Thank you for stopping by my blog. I always appreciate your visits. As always, I pray for God's highest and best to you today and every day. Many rich blessings, Ginny B. What a beautifull card, love the colors and the die! Thank you for joining our Challenge at Creative Moments, good luck! One of my favorite color combinations, yellow and blue. Very cheery card and beautiful sentiment. 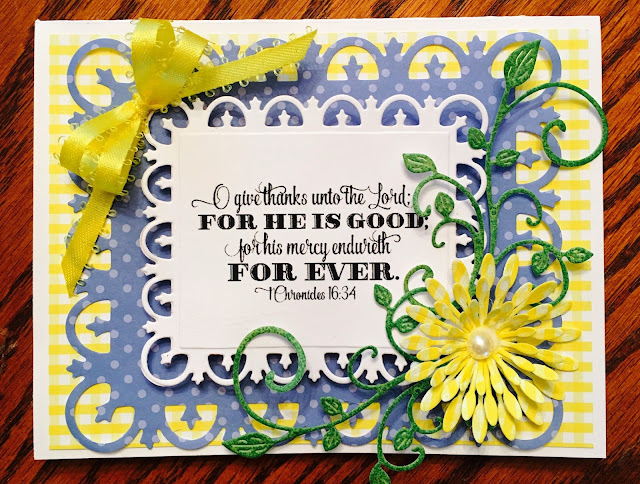 Thank you for sharing your design in our Spring into Spring Challenge at Crafty Cardmakers. Beautiful card! Thank you for joining us at Creatalicious Challenges! A great card - thanks for sharing it with us at Lil Patch of Crafty Friends. We hope you'll join us for our new challenge which started today. Thank you soo much for taking part in our "anything goes with optional flowers” challenge over at Creatalicious & good luck in the draw.